So it’s happened. 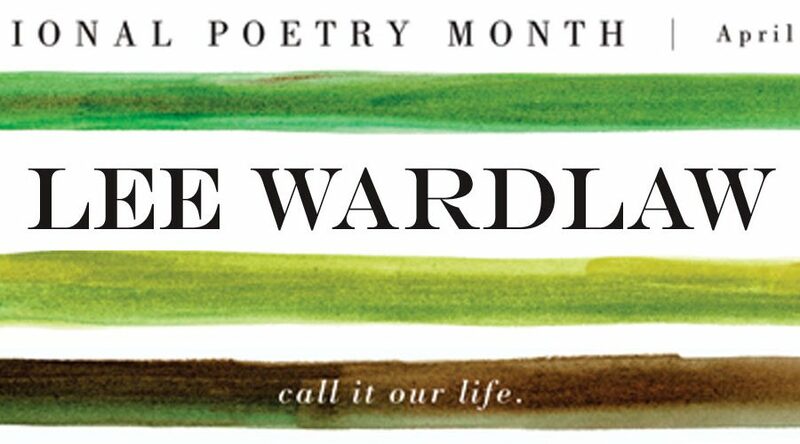 The last day of April has arrived, which means the end of Poetry Month 2012. It has been a delight to see all the wonderful events going on around the blogoshpere, to participate in some of them, to forge new friendships, and to have brought ten outstanding poets to my own event here at No Water River. Though these weeks have been a whirlwind, and I usually didn’t know what day it was, I am so thankful to have met these people, each one kind and generous and ever so willing to set his or her verse free in the wild for all of us to enjoy. Thank you, Poets with a capital P! Thank you, Kenn, Amy, Laura, Debbie, Greg, Charles, Irene, Julie, Lee, and Pat. I’m honored to know you, one and all. Now, we have so much to celebrate today, so let’s get to it! HEATHER N.! Congrats, Heather! I know you’ll love poring over all the gorgeousness in this book. Like all the other poets featured this month, our final poet accepted the invitation right away, gamely hiking into the woods not once, but twice to bring us his poem on video. It has been my sincere pleasure to work with him on this project. 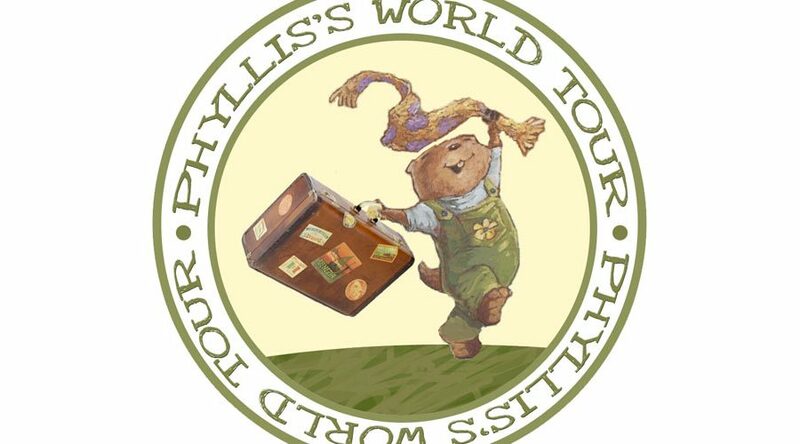 The prolific author of dozens and dozens of books of poetry for children, Pat’s most recent projects highlight his immense poetic range, and include a joint venture with Jane Yolen on Take Two! : A Celebration of Twins , his union of poetry and math in Edgar Allan Poe’s Pie: Math Puzzlers in Classic Poems , and his forthcoming collections If You Were a Chocolate Mustache and National Geographic Book of Animal Poetry: 200 Poems with Photographs that Squeak, Soar, and Roar! 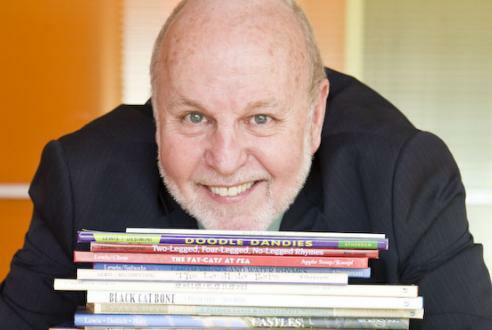 Besides being named Children’s Poet Laureate in 2011, Pat also received the NCTE Award for Excellence in Poetry for Children, and his books have received many honors and awards over the years. And it raised a big red welt. But a skeeter’s got to eat! And I must have just forgot ‘em. Archie, Buck and Theo too! You could hear ‘em goin’ HOLY! You could hear ‘em goin’ WHACK! Thought a skeeter’d tell a lie. Pat and I had our Skype interview a couple of weeks ago right before he left for Moscow on a Poet Laureate mission. At just about the same time that Pat was learning his luggage was vacationing in warmer climes, my computer blew up, taking the interview video with it. Yes, I know. After a few frantic hours of emergency recovery operations that restored only two tiny segments, I delivered the bad news. Pat, jet-lagged and without a pair of socks to his name, said to email him the day he got back — and before he jetted off to Chicago — to see if he was up to redoing the interview. It was only then I realized we had taped our first interview on Friday the 13th. Cue spooky music. I prepared for the worst, by which I mean I did my best to make lemonade on the chance that Pat simply wouldn’t have time for a do-over. And by lemonade, I mean I wrote 30 rhyming couplets summing up what I remembered from our conversation. I didn’t say it would have been sweet lemonade. Luckily, Pat found time, so you all owe him a serious debt of gratitude for sparing you my bitter verse! As do I. So thanks for your good humor and for the do-over Pat, jet-lagged (you) and frazzled (me) as it was! An abridged transcript follows, including some tidbits that did not survive the video massacre. Pat, I have to start by asking you the same question I ask every poet: just how long have you been a rhyming fool? Ha! I came to it very late. I was a college professor of economics for many years before I discovered poetry at the age of 39, and then I became a fool for it. The only thing I knew is that I loved it and wanted to spend the rest of my life with it, so I started reading poetry for about three or four years. Then when I thought I knew something about the craft, I started to write. Was your son scarred for life when “Mosquito” first came out, or did he enjoy being the star of the poem? And does he wear a belt now? Oh, no, he was around 25 when I wrote that poem, so he got a big kick out of it. And yes! He did learn to wear a belt! You are currently fulfilling your duties as the U.S. Children’s Poet Laureate. What would you say your “mission” is during this time and, more importantly, do you get to wear a sash and a crown? Believe it or not, The Poetry Foundation did not supply an official sash or crown, but my editor did send me a crown when we got the news about the laureateship. And on one or two occasions at school visits, I’ve been met with a crown and a King Arthur robe, so that’s been fun! As for my mission, when they called me and told me I was going to be the next Children’s Poet Laureate, the director said that my duties would be light, namely two main speaking engagements, one at The Poetry Foundation in Chicago and one at Poet’s House in New York City. I see my own mission as being a kind of pied piper for poetry, and that’s why I continue to make school visits, like the one I’m leaving for soon at the Anglo-American School in Russia. You’ve written over 70 children’s books, most of them poetry. I can’t imagine they are all about bad-mannered insects…so what are they about? Do you have any favorite subjects to write about? What types of subjects inspire you? I think what inspires me is that there are so many subjects about which to write. I’ve done books on Michaelangelo, Galileo, famous women, famous black Americans, famous monuments around the country, the Civil War…so whatever I haven’t done yet, I guess I would have to say I would like to do. Right now, for example, I’m working on a collection with a lovely author about the March on Washington in 1963, and Kenn Nesbitt and I just got a book accepted called Mongolian Death Worm. It’s about cryptids, which are animals that people have speculated about but haven’t provided confirmation that they exist. So most of your books are thematic rather than general collections of poetry? Yes, though in the next year or so I do have a general collection of about 156 poems coming out called If You Were a Chocolate Mustache, plus the National Geographic anthology, which features photos of animals rathe than illustrations. Other than squishing skeeters and running off to Moscow at the drop of a hat, what’s your favorite part about writing for children? Well, I suppose the first thing is that I get to write books for people I love, my friends and my family. Secondly, I get to make school visits and hang around with teachers and students for a day, which is always energizing, and I love doing that. But I suppose the biggest thrill for me is the fact that I can sit here in this chair and play with words all day. And what better job is there than that? I can’t imagine there’s anything better than juggling words, hoping that some of them come out to have some lasting effect. I think it was the poet Donald Hall who said that you should get up every day thinking that you are going to write great poetry. Will it happen? No, it won’t, but when was that the point? The point is not to write great poetry; the point is to strive to do so. And you can substitute art or music or dance, and that’s what we should all be doing. Donald Hall also said that the last third of one’s life should be devoted to work, rather than retirement, so I’m giving it my all. So there you were, teaching economics, and in a flash of flimsy skeeter wings, you’ve got a book of poetry. What was your first path to publication like, especially considering how difficult it is to get poetry published? What happened is that I visited a place called Cumberland Falls, Kentucky, and if you’re there at the right time of year with a full moon, you’ll see something called a white rainbow. I saw that and was inspired to write a story, which I sent to a publisher. Two weeks later they accepted it, and I thought Wow, this is going to be easy. Two and a half years later, the publisher reneged on the contract. It broke my heart but taught me a very good lesson — and that’s that this is not going to be easy. For the next seven years I got nothing but rejections until my first book was accepted in 1985. But in that seven years I had also been writing a lot of adult poetry, which was published in several journals. But you come to realize that writing adult poetry is like writing in sand; it gets accepted in journals with a readership of a couple hundred people, so no one sees it. And getting a whole collection of adult poetry published is beastly difficult, so my hopes for anyone trying to do that are great. So during those seven years, you didn’t quit your day job? You were still teaching economics while you were submitting your work to publishers? Exactly. Actually it was ten years, as I got my first children’s book published in 1988 and I retired in 1998 when I thought perhaps the combination of writing and school visits would be sufficient to allow me to be a full-time writer. And so far it’s worked, so I’m happy. I imagine you had to take a ton of poetry classes as an economics major. Or are you just a natural? Oh, my dear, you would imagine incorrectly! I took only one poetry class, and unfortunately it was the same kind of class many teachers have taken. It was all about analysis, and for me, poems should never be analyzed; they should be read for pure entertainment. So the short answer is that all of my poetry “training” was self-taught. I fell in love with poetry, realized I knew nothing about it, and spent four years reading books of and about poetry and prosody. When I thought I knew something of the craft, I started writing. And a lot of my first efforts were just execrable! I mean, they should never have seen the light of day…and they haven’t, fortunately. You mentioned one of my soapbox subjects, which is appreciation of poetry over analysis. That’s a big part of what No Water River is about – just having fun with poems and setting them free in the wild through the videos. I do think too much time and effort is spent on ripping the guts out of poems — and I’m glad to have the Children’s Poet Laureate backing me up on that! Yes, and if I could add something to that, it’s that poems don’t have to be funny to be entertaining. When I sit down in the chair every day, I’m not necessarily trying to write funny poems. Maybe half the time, but I love to write serious poems, biographical poems, poems about the lives of famous characters, and poems about famous events like the Civil War, and I think those kinds of poems can be equally entertaining. They don’t have to be knee-slappers; serious poetry can be every bit as much fun as funny poetry. I mean, I understand that Shel Silverstein and Jack Prelutsky, for example, didn’t write much serious poetry, and that’s wonderful — they should do what they want to do. But I don’t want to do that. I’m trying to write in a hundred voices across the curriculum for all ages. So let a hundred flowers bloom! If people come up to me and say they read a poem that they were sure was mine, that’s not a compliment. I don’t want people to know that a poem was written by me. If the poem is any good, you should be able to erase the poet’s name. Poems, if they have any chance of living on, might well do so without the poet. Yes, I read many of your poems on different themes and from different books, and can see that you do write in many voices. Though I’m not sure it’s all bad for a poet to have a distinct voice, at the same time it’s wonderful to stretch, which is part of the poet’s job. And one way to stretch is to move away from common ballad verse. I’m trying to write in foreign verse forms and completely unexpected verse forms, and I think all poets should do that. I think even humorous poets can stretch their muscles by moving away from the tetrameter quatrain and ABAB or AABB rhyme schemes. I just think those get kind of tiresome, especially if you read a whole collection of them at one time. Along those lines, what is your best advice for kids who want to write poetry? First I would say, as I always say…don’t rhyme. When you put yourself in the box of rhymes, it’s like putting on handcuffs — it’s too difficult to write yourself out of it. If they were willing to sit in the chair and work on it for eight hours, that would be fine; but they aren’t. They write it once and think it’s over, but a poem written once is never finished. That’s not news they want to hear, but I don’t see why we should tell them otherwise. So I’d say, when you’re writing poetry, just write. Let it be prose lines, let it be free verse. If at some point they want to become poets, they can go back and learn the tricks. You give a kid a rhyme, and he rhymes it in such a way that it doesn’t even rise to the level of good nonsense. (Because they don’t have the literary chops to do that yet.) Right, so I don’t think they should ever be encouraged to rhyme. What’s your best advice for poets who want to get their poetry published (other than don’t bother)? Well, first of all I would tell them what they already know, that it’s incredibly difficult. I’m so glad I started when I did. The only advantage poets have today is the publication of the Children’s Writer’s & Illustrator’s Market, so they should study that very carefully. But boy, it’s tough. Agents are in the business of making money for themselves, so they aren’t going to take on an unrecognized client, so you really do have to have something published. So the answer is to keep submitting and hope lightning strikes. You mean submit to magazines? Magazines are pointless. There are about 600 journals for adults and maybe six quality ones for children. But even if you get a couple poems published in Cricket or Highlights, that doesn’t make a collection. So you just have to hope that this accretion of publication continues and you have some kind of track record to show an agent. It helps, of course, if you know somebody; if you don’t, you just have to go through the routine of sending out and waiting. But usually the response time for book manuscripts is six to eight months, so you can get very old very fast, so do multiple submissions whenever you can. Can you recommend any particular books of children’s poetry, or particular poets, that you think kids should read? Why? Let’s suppose for a moment that I were a teacher with a third-grade class, and my objective was to get them interested in poetry, I would first fill the classroom with all kinds of books — let a hundred flowers bloom. And not just the kind of poetry I like, but all kinds of poetry: funny poetry, nature poetry, serious, biography — all kinds of poetry. I would also break up the day with “drop everything and read sessions.” I would encourage more participation between them and the library. Set up a poet’s corner in the library. There are so many interesting things teachers can do! And as far as what they should be reading, I know you have a penchant for the classics. Only because I wanted to know as much about poetry as possible. I think many poets today start writing without having read. I’m not talking about going back to Greek and Latin poets, but at least 18th-, 19th-, and some 20th-century poets. And you mentioned in our first interview how wonderful poets like Lear and Milne and Carroll are to foster an appreciation of language in kids. Da! Oops, speaking like a Russian! And in fact, my love for Lear inspired me to write the book Boshblobberbosh, a collection of poems about the poet. I do! It’s the website I originally set up to facilitate school visits, and it’s worked very well for that. Unfortunately, I’m a techy…idiot, for lack of a better word, and it’s not updated as much as I’d like, though I do try to keep up with the list of my books. Pat recently returned from a two-week visit to the Anglo-American School in Moscow, the same school his son attended for kindergarten back in the day when Pat was in Russia as a Fulbright Scholar. While there this past week, he starred in this brief and beautiful video, put together by his hosts. Enjoy! Read Pat’s answers to the questions most frequently asked by schoolchildren, and some fun riddles. Did you know Pat is a twin? See some family pics! The J. Patrick Lewis Poetry Toolbox is an incredible resource created by Sylvia Vardell to promote the works of Pat Lewis. The site contains an alphabetical listing of Pat’s books, as well as extensive readers guides and digital trailers created by teachers and librarians enrolled in graduate courses in children’s literature at Texas Woman’s University. The best way to navigate the site is to use the search box in the right sidebar to look for the title you’re interested in. Using “Mosquito” as a model, have students write their own poems about the insect of their choice. Your library may have a copy of Pat’s book Two-Legged, Four-Legged, No-Legged Rhymes, or you might use the Lee Bennett Hopkins anthology Nasty Bugs for inspiration. PBS.org’s wonderful elementary geography/life sciences lesson plan The Trial of the Bloody Sucker covers all sorts of blood-sucking insects and contains over a dozen links to other resources. National Geographic offers a K-2 lesson plan on Insects We Love and Hate. Artists Helping Children offers several mosquito crafts that make these critters cute, while Family Crafts provides links to mosquito handouts, fact sheets, and activity sheets. Never! As Pat said, let’s all let the end of Poetry Month be but a comma in our ongoing appreciation and celebration of children’s poetry. To that end, No Water River will continue to feature poetry videos and interviews of established and unpublished poets alike, as well as the humble poems of yours truly, all year long. I’ve already got plenty of goodies scheduled for the coming months, so I hope to see you back here soon! Video Location: The woods in Westerville, Ohio, where our poet laureate combats marauding mosquito mobs and writes some poetry now and then. What a wonderful month of poetry videos and interviews with start poets to inspire us with their craft and that we should not give up writing our own poems. By the way I lot pat and Jane’s interviews! Loved this interview, Renée, though I am kinda sorry that we missed out on those 30 rhyming couplets! Just saying’!! Maybe I’ll slip them to you on the sly, Joanna, haha! I was desperate! Oh, I loved the story that Pat shared along with his sneaky-smacking-skeeter poem, and I will be sharing this tonight with my children. How lucky we are to have such an open-hearted Children’s Poet Laureate. This post is both inspiring and meaty, and I thank you both. a.
Glad you enjoyed it, Amy! We are lucky – Pat is truly gentle and inspiring. Aw, I’m so glad you’ve found these posts useful, Catherine! And I agree, that’s one of my new favorite things to say. Can I tell you how much I just absolutely love that poem? I live in Texas where we have TEXAS SIZED mosquitoes–and I think that poem is just about the best skeeter poem, that my ears and eyes I have ever been treated to–Thank you so much, Mr. Lewis for sharing it. I loved what you said about poetry. And thank you for being so gracious and redoing the interview. It was both enlightening and entertaining. YAY! Thank you for all your wonderful comments, Natalie. So glad you enjoyed and learned and appreciated with me all month long! We better plant some more poetry video seeds right quick! I know! It was a busy month, but so much fun! 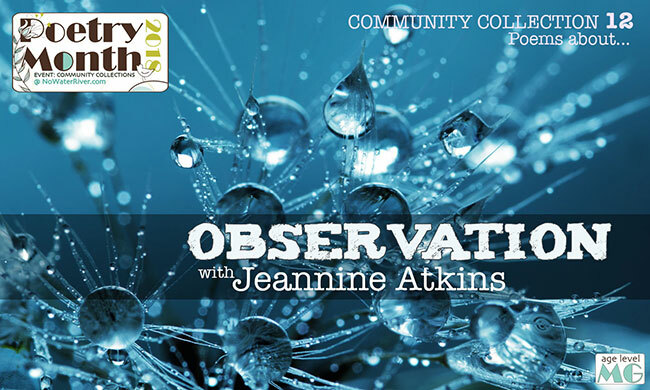 What a great interview to round out poetry month, Renee! But of course, as Pat said, poetry should never be over, just always continuing. I’m glad someone else agrees that poems should be read for enjoyment and not analyzed – I never liked doing that in school! Thanks for a great poetry month! Looks like there’s a bunch of people who prefer to appreciate instead of analyze (to death). Hooray for word lovers! What a PERFECT way to end National Poetry Month then with J.P.L. A good man and a fine children’s poet. Amy’s right, Pat is so openhearted. Renee and Pat deserve a might big thank you! Yup, he’s kind and gracious and generous with his poetry and his time — the perfect ingredients for children’s poet laureate! Oh, I was just itching to hear Pat read Mosquito. What a fun poem! And I he is so humble, delightful and inspiring. I love that he says (and you concur) that poetry should be read for pure entertainment and not analyzed (to death.) We are lucky indeed to have him as our poet laureate. And we are lucky to have you, Renee to bring all these wonderful poets to us. Thanks for all your hard work. Thank you so much, Iza! And I’m lucky to have such supportive new friends! 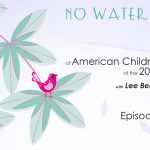 Thank you, Renee – and to our Children’s Poet Laureate too! What a great post and a way to CELEBRATE (I won’t say “end”) this month of wonderings and ponderings. This has been such a fine series with delightful interviews – the videos have been brilliant, and you’ve created treasures readers young and old can revisit. Can I say THANKS again? Aw, thanks, Robyn! I do hope people continue to find these posts entertaining and useful. Great post! I love the Skyperview! Mr. Lewis, I love the poem! I am sad that April has ended. That means that National Poetry Month is over. I will still write and read poetry though! Thanks for the great month Ms. LaTulippe! Pat Lewis seens ti be good-hearted, wise, sweet, darling, witty, bright, instinctive – a good listener as well as a good talker – all in all, a great Children’s Poet Laureate. I love the idea of a poem first washing over a reader, all pleasure – no analysis at that point for meaning. However, Pat can talk comfortably about all kinds of structural issues behind the WRITING of poetry – the ballad meter, avoiding the 4/3 sing-song, working with different rhyme schemes, trying our hands at classical forms, exploring foreign forms, etc. – he knows how to look at a poem’s structure and understand how it was built, how it “stays up,” so to speak. I don’t think that anyone should try to impose a single meaning on a poem, but learning to look at the architecture of the poem when they want finally to be poets – as Pat said, that’s when the learning how becomes as important as the enjoyment. Thanks to Pat for the liveliness and sincerity of his responses – and Renee thank you once again for the whole lovely month of videos. I couldn’t agree more, Julie! In fact, looking at structure and learning how a poem fits together is a big part of the appreciation (and entertainment!) I was talking about. As a teacher, I tried to foster appreciation of both an author’s words AND his craft, because learning craft is FUN! My issue was with beating a poem to death to extract its “meaning.” As an undergrad, my “analysis” classes sucked all the joy out of poetry for me, and I stopped writing for a couple of decades. What a shame! And yes, Pat is all those things. I’ve learned so much from all of you this month! Take a bow Renee, for your incredible work during National Poetry Month! Amazing devotion of time and effort on your part to make certain that poetry for children remains front and center, accessble to all. And a standing ovation for our outstanding Children’s Poet Laureate! How fortunate we are to have a national treasure of such caliber. ((SWAT)) Oops…one less sly mosquito bandito. But it doesn’t stop here, Cathy, as you know! The poetry continues, and I hope you’ll be coming back to share more poetry in the future. I’ve had a marvelous time reading & watching your blog this month, Renee. You did such an incredible job with all your videos & interviews. It was a wonderful treat to meet each one & discover more about these wonderful writers. Thank you, thank you! And thanks to J. Patrick Lewis for showing off his continued enthusiasm for poetry. Hurrah for the children he touches. Thank YOU, Linda, for your early support of the event. 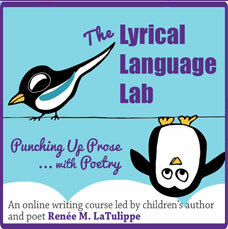 I hope to reach even more teachers like you, building a valuable resource for teaching poetry! Another wonderful post, Renee! Ethan has so enjoyed the videos this month and I have enjoyed reading the interviews with people who are passionate about poetry. I think J. Patrick Lewis has it right, we’ll call this post the comma and move into May bringing the poetry along with us! You have a great archive of videos that we’ve just begun to dip into here and we’re looking forward to exploring them all. 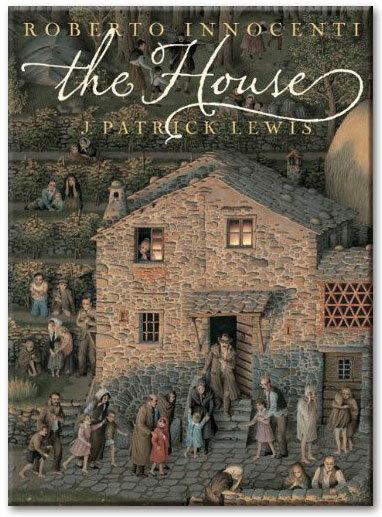 The House was added to my wish list and I’m so excited to have won a copy! The boys and I will have to head out to the yard to read the poems out loud. 🙂 Amazing Poetry Month here at No Water River. Congrats on winning THE HOUSE – I know you and your boys will love it. I love the idea of reading the verses out loud in your yard – go for it! Hey, J. Patrick Lewis, I am not to far from you. We live in Aurora, Ohio! Those pesky mosquitos will be bothering us very soon! But, at least it will be warm and pleasant! Thank you for sharing your poem! Renee, thank you so much for your National Poetry Month celebration. Your hard work has taught, entertained, and inspired so many people this month! Glad you found the posts enlightening, Eric. Maybe you can wear your beekeeping suit to keep those mosquitoes at bay — or at least knit them sweaters! Congrats to Heather! And thanks Pat! What a wonderful way to end poetry month. Renee, I have loved every post this month. I kept tucking them away in my browser, so I could write a long comment for each. Then life got away from me. Thank you, thank you for a wonderful month of poetry and fun! Life tends to get away quickly when you have twins – I understand perfectly! But I’m so glad you’ve enjoyed them, Hannah! Dear Renee, thank you so much for a wonderful, wonderful month! I love this interview with Mr. Lewis who most definitely should be wearing a crown. I love especially that he said “magazines are pointless” and “write in a hundred voices” and “don’t rhyme.” And hey that skeeter poem was so much fun! Thanks to both. What a pleasure! I loved all those snippets, too, Irene. So glad you were a part of the celebration this month! Your skype interview was GREAT! I enjoyed meeting Pat. He’s got strong opinions about poetry. Although, I think that’s inherent is all writers. I love the idea of allowing children to share their thoughts, perspectives, their view and be able to say it’s poetry. I think this can even be done with early learners. Lots of great information, from a man unapologetic about his passion. I love it! Wonderful way to end the month of poetry. Thank you Renee. Yes, what you said, Pam! Thanks for coming by all month! Pat is such a terrific poet–one of my favorites. He’s knowledgeable but never too academic. A wonderful juxtaposition, just like his widely ranging–but all wonderful–poetry collections! Thank you for all your work this month bringing us so many wonderful poets. A perfect ending. Thank you Laura and Doraine! What a fabulous treasure trove of great stuff in this post, Renee! Pat sounds just the sort of person who SHOULD wear a cape and crown as our poet laureate . I have to agree, Tara. He’s a treasure in himself! What a fun poem! I love it! That poem is pure delight! My daughter happened to be on my lap while I listened to his reading, we were laughing out loud! I love his responses to your question about what to tell children who wish to be poets and what he had to say about rejections. Great interview! Thanks, Renee! I truly enjoyed learning more about one of my favorite poets! He is so inspiring, generous, and kind-hearted. I have many of his books, and I look forward to reading more. Thanks for stopping by, Linda! I also find Pat inspiring — in fact, he’s inspired me to start a new series of classic poems for kids! Great post! 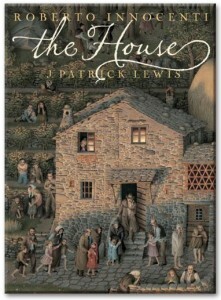 I got a book signed by J. Patrick Lewis this week! Oh wow! like Catherine I teared up listening to Pat, he was wonderful. You are such an expert with interviews and these videos, so amazing. I’m sorry I don’t always comment but I have to say I have loved all your videos. Who knows maybe oneday I will write a series of poems. Pingback: Joe Mohr reads his poem for children "Flybrows"
I was just wondering what book the “Mosquito” poem is from. I’d like to purchase it as children’s gift.